One a month I meet with three other ladies to stamp. Two of the gals are hobby demos and one is just another addicted stamper. 🙂 All 3 of them use a mix of Stampin’ Up! And non-SU product. We were making a project comparing yellows and grays. When one of the gals brought out a pack of smokey slate cardstock and said “who wants this? I think it’s ugly! I don’t want it.” Granted, it didn’t work for our project, but I like that color. I like all Stampin’ Up! colors. While the other ladies continued on with our project, I got busy. I used her stuff and made this card. I used Smokey Slate for the base, layered with the Sweet Sorbet Designer Series Paper (That’s FREE during Sale-a-bration!!). Then I used the oval framelits to cut a layer of Smokey Slate and one in Whisper White. 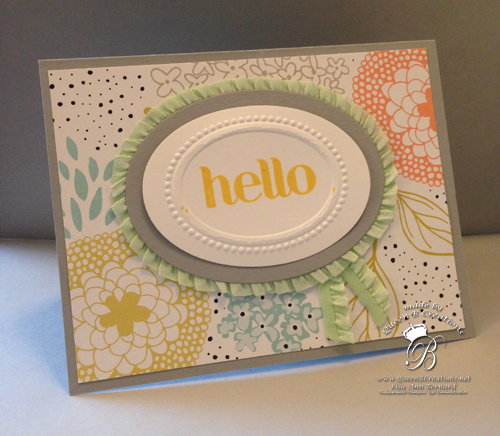 The Whisper White oval I ran through the big shot again, this time with an embossing folder, then stamped “hello” in the middle (I had to use Daffodil Delight, since she didn’t have the So Saffron Stampin’ Pad). Around the Smokey Slate oval, I used the Pistachio Pudding ruffle ribbon. The ovals are afixed with Stampin’ Dimentionals. Now she likes it and kept it. LOL We almost got some free cardstock! But, I was a happy just to prove (once again) that Stampin’ Up! is awesome!